In 2011, 51% of Russia’s food was grown either by dacha communities (40%), or peasant farmers (11%) leaving the rest (49%) of production to the large agricultural enterprises. But when you dig down into the earthy data from the Russian Statistics Service you discover some impressive details. 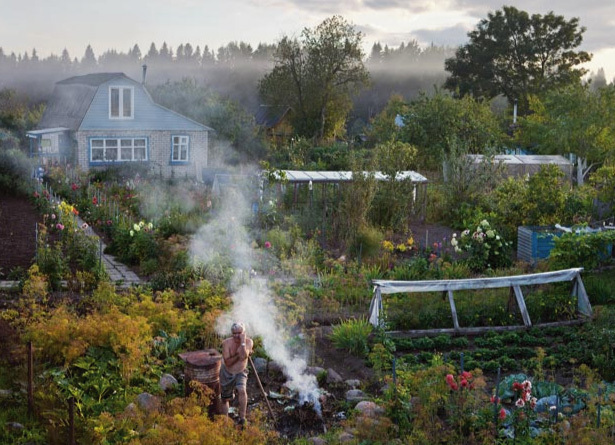 Again in 2011, dacha gardens produced over 80% of the countries fruit and berries, over 66% of the vegetables, almost 80% of the potatoes and nearly 50% of the nations milk, much of it consumed raw. While many European governments make living on a small-holding very difficult, in Russia the opposite is the case. In the UK one councillor‘s opinion regarding living on the land was, “Nobody would subject themselves to that way of life. You might as well be in prison“; tell that to a nation of gardeners living off the land. Read the rest of the article HERE on Natural Homes.